Drama. 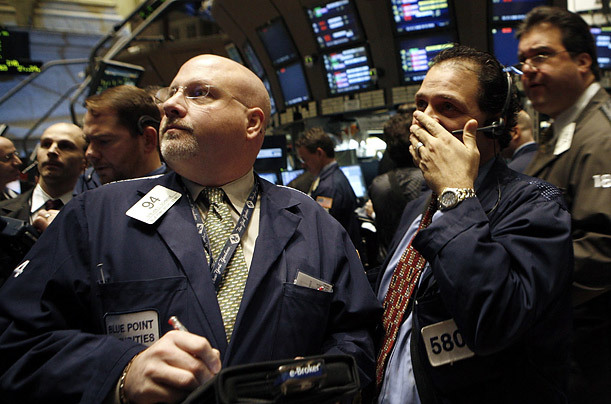 Analysts and investors keep trying to find “information” in stock prices, and they’ve been trying to do that for more than a hundred years, to somehow relate past and recent stock prices to what they might be tomorrow, or eventually (The Street, June 5, 2014, The Expected Rise and Inevitable Fall of MannKind). They ought to have discovered, by now, that there is no information in a stock price, or even a bunch of stock prices, that could in any way suggest what the future stock price might be, or even within some “volatility”-based range, or even within a “reasonable expectation”. Nor is there any medicine or treatment that might cure them of that “bad habit”, the gambling habit, nor are we about to offer any, because we understand its nature. But we also note that that is not a question that is asked by investors who buy “markets” and use some variant of Modern Portfolio Theory (MPT) and the Capital Assets Pricing Model (CAPM) to buy a piece of everything, according to some grander “vision” to which individual stocks are expected to respond, or be driven to respond, for which reason we also don’t know, because for all that, we’re provably better-off by just buying, holding or selling the actual stocks of that same entire market without trying to “parse” our vision with assorted “fractions” that depend on “expected returns” which are a guess, anyway, and anyway, don’t drive the prices. Nor can we help them (The Wall Street Journal, June 5, 2014, Morningstar to stock pickers: You’re worthless – which author has an agenda and “sells” ETFs and takes comfort in that fact by alleging that there is some kind of “science” involved – alchemy?). We can, however, offer a reason that we might buy a stock, rather than some vaporous paper in a mutual fund or ETF. The reason is that our money is certainly (that is, for sure) better-off invested in the stock than it is invested in our pocket, where it’s likely to melt-away into nothing unless we do something to make it work for us; please see Figure 1 on the left. And we also know, and can prove, that our money invested in a stock that is trading at or above the price of risk is “as good as cash and better than money” and working hard for us because in addition to 100% capital safety and 100% liquidity (which is what we have in cash), we are hopeful, and have reason to be, of a return on our money that exceeds the rate of inflation and therefore, preserves or betters its worth. And as we’ve said before, those are the words that move us – safe, liquid, and hopeful – and if we don’t hear those words, we can stop listening because the next offer won’t give us what we want. And we can also give a reason, the same reason, that we might not buy or hold a stock if it’s trading below the price of risk and therefore, it is not safe, not liquid, and although it might be hopeful, we can wait until it demonstrates a reason for such hope, and until that time, it’s just a stock and a piece of paper that is trading in the (N)-zone of investor uncertainty. So-armed with our own bias, but a reasonable understanding of above and below, we can now examine today’s straw-men for the words that we want to hear – safe, liquid, and hopeful. 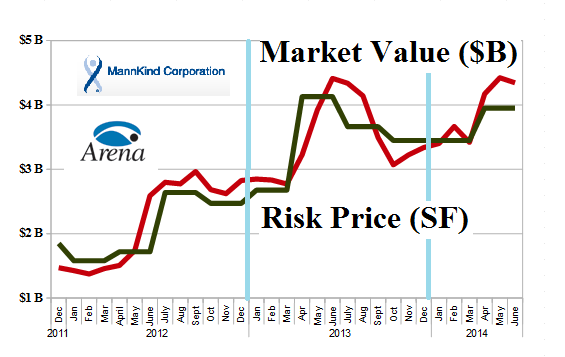 First-up is MannKind Corporation (please see Exhibit 3 below), which is now waiting for an FDA-approval announcement that is scheduled for July 15 on its new product, Afrezza, and the stock market, being a team sport, is also waiting and watching and stirring at the doorstep – Yes, we win – No, we lose – on July 15. It’s true (please see Exhibit 3 below) that MannKind at $10+ is trading above the price of risk ($6) right now, and we can buy it on that basis at any price above $6, but we’ve jacked-up and set our stop/loss at $9.50 currently, because we have no idea what is going to happen on July 15, which is a Tuesday, and the day before a local celebration of “World Snake Day” which we also need to prepare for. 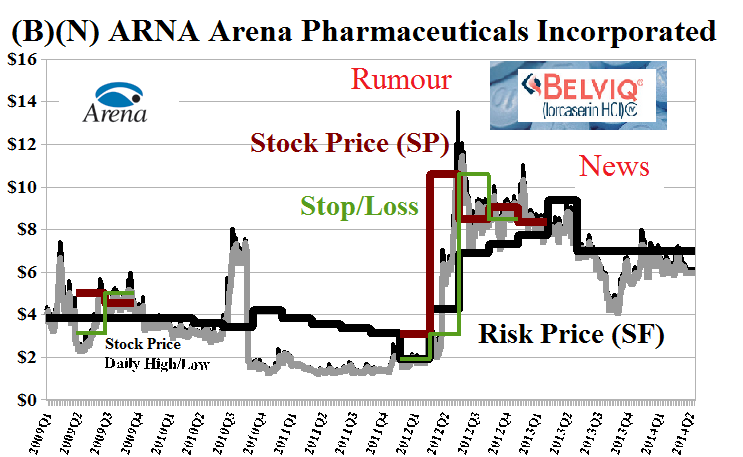 Of course, when rumour becomes news, investors might sell again, as in the case of Arena Pharmaceuticals which went through a similar trauma and elation, twice, before its new drug, Belviq, was approved and is now in production as its one product; please see Exhibit 2 below. A normal person would easily be excused from the hunt for “profit” and dividends in these two companies, whose demonstrated interest is elsewhere; please see Exhibit 1 above. We also note, however, that investors are willing to pay $276 for $1 of the Coase Dividend, which is 10× the going rate for the ordinary companies on Wall Street, and the expectation must be that these companies will someday be “worth” at least five-times what they are now (N* $0.5 billion compared to N $0.1 billion), and so they must be expecting future earnings well in excess of last year’s losses of ($274 million); please see Exhibit 1 above for the details and click on the link (and again to make it larger) for the latest news on “(B)(N) MannKind and The Belviq Chronicles – Prices & Portfolio – June 2014“. Arena Pharmaceuticals Incorporated is a biopharmaceutical company engaged on discovering, developing and commercializing drugs that target G protein-coupled receptors to address unmet medical needs. From the Company: Arena Pharmaceuticals Incorporated a biopharmaceutical company, discovers, develops, and commercializes novel drugs that target G protein-coupled receptors. The company offers BELVIQ, a drug used to treat chronic weight management in adults. Its products under development include APD811, an agonist of the prostacyclin receptor, which has completed single- and multiple-ascending dose Phase I trials for the treatment of pulmonary arterial hypertension; and temanogrel, an inverse agonist of the serotonin 2A receptor for the treatment of thrombotic diseases, which has completed single- and multiple-ascending dose Phase I trials. The companys products under development also comprise APD334, an agonist of the sphingosine 1-phosphate subtype 1 receptor for the treatment of conditions related to autoimmune diseases, which has completed Phase I single-ascending dose trial; and APD371, an agonist of the cannabinoid receptor 2 that is in Phase I single-ascending dose trial for the treatment of pain. It also manufactures drug products under a manufacturing services agreement for Siegfried AG. The company was founded in 1997, has 310 employees, and is based in San Diego, California. 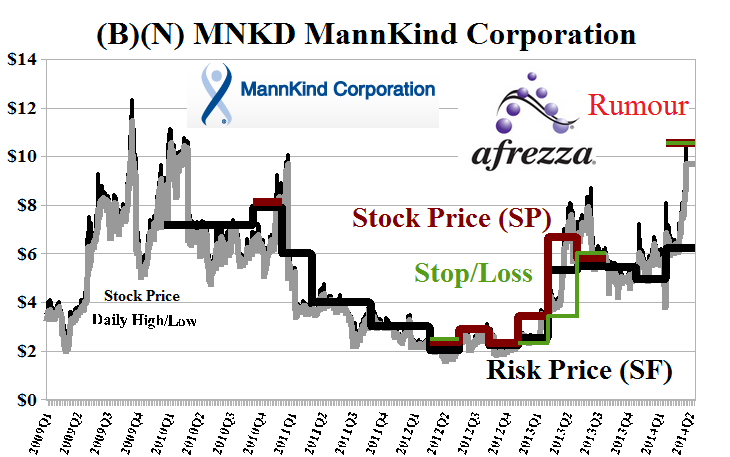 MannKind Corporporation is a development stage company engaged in the discovery, development, and commercialization of therapeutic products for diseases such as diabetes. From the Company: MannKind Corporation, a biopharmaceutical company, focuses on the discovery, development, and commercialization of therapeutic products for diabetes and cancer in the United States. Its lead product candidate is AFREZZA inhalation powder, an insulin that is in late-stage clinical investigation for the treatment of adults with type 1 or type 2 diabetes for the control of hyperglycemia. The company is also developing MedTone and Dreamboat inhaler devices. MannKind Corporation was founded in 1991, has 265 employees, and is headquartered in Valencia, California. ← (B)(N) What’s A Girl To Do?